In fact, as it has been observed, companies that invest in efficient safety management program have significantly improved their business outcomes in terms of revenue streams. Not to mention, the dynamically changing personal protection equipment industry landscape is certain to have a perpetual influence on industrial safety gloves industry size. Incidentally, estimates claim industrial safety gloves market size had been pegged at USD 5 billion in 2017. The marketplace is ablaze with abundance of innovations by renowned companies that have been scrupulously planning to effectuate commercialization of novel worker safety products. In this regard, the launch of AlphaTec® 58-735 in the industrial safety gloves market place is worth mentioning. Elaborating further on the subject, Ansell, one of the renowned names in the industrial safety gloves market, has introduced this multi-hazard nitrile glove that claims to address all the potential workplace hazards in one solution- providing chemical protection and cut defense in addition to offering exceptional grip and comfort. While the green outer nitrile shell ensures excellent chemical resistance, the HI-VIZ™ INTERCEPT® yarn on the inner layer allows extraordinary comfort and high-performance cut protection. On the grounds of its unique combination of features, experts have been already raving about the product, claiming it to be disruptive across various hazard prone sectors like chemical, oil & gas, food & beverage, machinery manufacturing etc. The instance further depicts the strong stance held by the nitrile gloves in the industrial safety ecosphere. For the record, nitrile-based industrial safety gloves market was pegged at a valuation of over 300 million units in 2017. The reason for the same can be attributed to the fact that nitrite depicts high resistance from oils. In fact, nitrile butadiene rubber – a copolymer of butadiene and acrylonitrile, is heavily deployed in the manufacturing sector. Driven by the fact that these gloves are extensively used across commercial applications which require resistance from vegetable, petroleum, as well as mineral oils, and water, abrasions, and acids, nitrile industrial safety gloves market is forecast to record a commendable CAGR over 2018-2024. Regulation EC 1935/2004 enforced by the European parliament defines the generic framework of requirements for objects which come in contact with foodstuffs. The regulatory coursework mentioned in Regulation (EC) 1935/2004 with regards to safety gloves were further substantiated in Regulation EU 10/2011. These mandatory roll outs, needless to say, have played a vital role in shaping industrial safety gloves industry trends in the food sector. As per OSHA’s 29 CFR 1910.1030, safety gloves must be worn when hands are in contact with potentially infectious materials like blood, mucous membrane, and non-intact skin. In fact, OSHA also mandates hypoallergenic gloves for workers in a blood-borne pathogenic environment. These mandates are liable to be complied with under any circumstances underlining the strong impact the regulatory norms have on the industrial safety gloves market outlook. Industrial safety gloves market, in the past few years, has indeed traversed a profitable path, even further than expected. The competitive spectrum is claimed to be quite consolidated with the presence of leading giants like Latexx Partners, Hartalega, Ansell, Supermax Corporation, Top Glove, Honeywell International, Riverstone Holdings, and MCR, having held a substantial proportion of the global Industrial Safety Gloves Market share in 2017. These biggies, as it is observed lately, have been adopting various contemporary as well as tried and tested tactics to gain a competitive edge. Amidst this intense share battle, product differentiation stands to be one of the major parameters underlining the competitive hierarchy of the industry players. 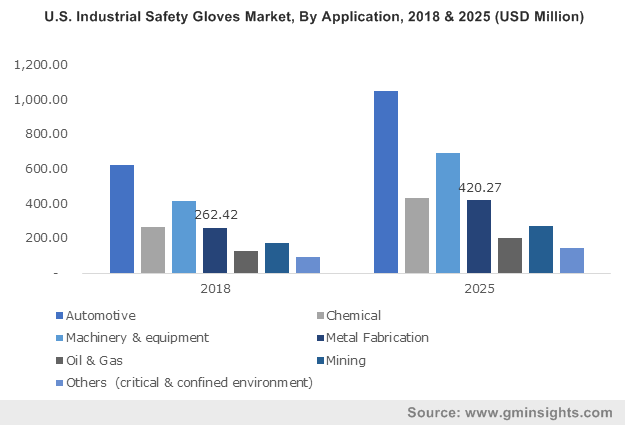 With such a rich product pipeline and the increasing emphasis to ensure workplace safety, industrial safety gloves market is certain to witness a slew of opportunities in the years ahead. Overall, the business space is projected to record a massive revenue of USD 9 billion by 2024.